Triple Olympic champion Usain Bolt set a new world record as he stormed to a stunning victory in the 100m at the World Championships in Berlin. The 22-year-old Jamaican recorded a time of 9.58 seconds to take 0.11 off the mark he set last year when winning gold at the Beijing Olympics. 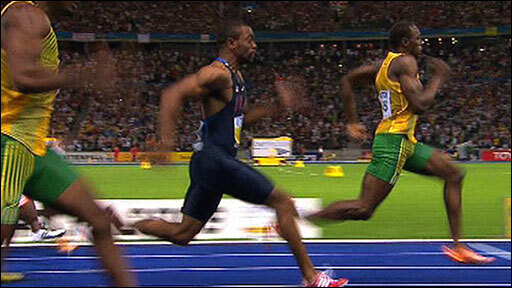 American Tyson Gay was second in a time of 9.71, with Jamaica's Asafa Powell claiming bronze in 9.84. Britain's Dwain Chambers came sixth in a season's best time of 10.00. Bolt, who set three world records when winning his Olympic golds in Beijing last summer, served up another superlative display to enhance his reputation as the best sprinter of all time. In the final, he powered out of the blocks at the first time of asking and took control of the race within the first 30m, the crowd going wild as he streaked across the line. Bolt's time represents the biggest increase in the record since electronic timing was introduced in 1968. 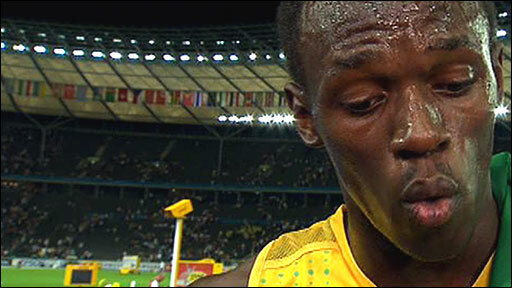 "I was ready, I was feeling good after the semi-finals," Bolt told BBC Sport. "I knew it was going to be a great race and I came out and executed it. It's a great time. I did well and I feel good in myself." Former world record holder Powell paid tribute to his compatriot, saying: "When I saw the time I had to try and catch him, but I couldn't." Gay, who went into the final as the reigning world champion, has been troubled by a nagging groin pain and had to cut practice on his start. "I ran the best I could but it was not enough," he said. "I believe I put in a championship performance and I am very pleased with the national record. "I'm happy he ran 9.5 because I knew he could do it. I'm happy for him." Chambers, back competing at the top level after serving a two-year ban for taking the designer steroid THG in 2003, said the final was a "great experience". "It is hard to explain what it is like to go out there and stand on the line to compete with the best in the world," said the 31-year-old. "It does not get easier as you get older but it is worth it." Earlier, there was controversy as Britain's Tyrone Edgar was disqualified from the semi-finals. After Bolt made the opening false start, Edgar was ruled to have transgressed the second time, although initial reaction times seemed to suggest that decision was harsh. "I don't think it was a false start," said the 27-year-old Edgar, who was also disqualified at the London Grand Prix last month. "To me it looked pretty good but there is nothing I can do. I am not going to argue the point. I am disappointed right now because I reckon I would have made the final."